Cor helped dress the injured dwarf as the party began to make ready to leave. Very quickly, it became blatantly apparent that the dwarf would not be help in the fight; he was barely able to stand, much less fight. The party left the dungeon, following Sirene's lead. The hallway ended with a large wooden door. Ulthok was up to it immediately, checking the door for traps. Cor stood back, battle axe in hand. Within seconds, Ulthok was finished his search. Pausing for a moment, Ulthok pushed the door open. What was revealed was not a pretty sight; a small force of enemies were there. Several were surrounding a table with a model of the magical castle on it. Perhaps these were senior members of the army? At the table stood one human, in good armour. Cor's blood boiled at the sight of him. Wasn't he smart enough to realize the consequences of what he was doing? Was he bribed or Coerced? Whatever the reason, he would be taken down. Ulthok advanced forward to blast the cone of cold, leaving him precariously exposed to the two Gith. Cor rushed beside him, readying to attack the the Gith ahead of him (#16). "Now I don't intend to be mean or anything, but I'd appreciate it if you stayed off my friend," Cor mocked, letting his axe finish the statement with a blow to the stomach. Posted on 2014-05-04 at 23:50:12. With the opening of a new door, the party once more found themselves in a new fight, a fight with a pair of unknowns included. With the party gaining the initiative once more, they set to work, the casters of magic again first. With Aliya moving back to guard the hallway, Ulthok using an item and Valene still MIA it came down to Sirene, Peri and Weaver once more. For Peri, going invisible as normal not giving it a second thought, unable by her nature to inflict harm, choose instead to cast confusion on the seven enemy gathered around the table. Too much thinking must be so tiring for poor things The Faerie dragon thought to herself as she released her innate magic. However, she was dismayed to see it only had an effect on the two Orcs and was even more surprised when the Human looked straight at her. It was then that she realized that she was fully in view her use of invisibility having failed her. Moving up to Ulthoks left side the Elf Enchantress�s voice rose in a haunting dirge to fill the air as her nimble fingers traced eldritch gestures in the air. Like the storm itself, her voice rose higher and higher as her body moved wildly calling for the rage of the heavens. With a final gesture, Sir�ne lifted her hands up into the air and threw back her head letting loose an unholy scream vibrating with rage and death. In that, moment all the power the witch raised was released into the room before her. A deafening clap and blinding flash of blue white light streaked through the room as she released a spell of Lightening Bolt. Configuring it to be forked the bolt blasted through the center of the room, barely missing the four Githyanki guards to streak through the seven foes at the table to hit the four Red Robes dead on. The four Githyanki guards at the south door having seen it coming were just able to phase away in time. The force of the spell causing the four Red Robes to be thrown to the floor and into a wall, leaving two dead and two critically wounded. Then hitting the same wall as the two dead Red Robes the bolt reflected to once again hit the two wounded, finally killing them. Continuing to move back towards Sirene it streaked once more through the seven foes at the table, this time dropping the two Orcs dead to the floor, to end just beyond. Though in all eleven foes had been hit only six were dead, leaving five foes at the table yet living. Then it was Ulthoks turn, his wand of Frost held gleefully in hand and within only moments a cone of cold was headed towards, then through, the left two Githyanki guards (#15, #16) and past to hit the eight Gith beyond them. (#1- In only moments, five out of ten Githyanki were dead ( #15, #16, #1, #2, #3) and the rest wounded and stunned for the moment due to the intense cold. Lothor as the door opened found himself face to face with a startled Githyanki guard. (#14) His greatsword in hand he was only able to get in a semi swing doing no real damage yet pushing the Githyanki back further into the room. Though no melee damage was given or received this round by Lother or his opponent the way through the door for the rest of the party was for the moment a little less blocked. For Roan, this was to be his first true action with this new party he had found himself a part of through mutual need. Hesitating not one second, he was quickly beside Lothor engaging the Githyanki guard before him. (#13) Both of his Khopesh�s in hand he threw a furry of blows at the Gith, smiling as one struck deep. However the Ranger/Cleric was lucky this round as the guards return attacks were all unsuccessful though very, very close. For Weaver, the next of the party to act, it was at once clear who his choice of enemy would be, his species enemy, Goblinoid, the Orcs a part of that. Moving quickly sword and dagger in hand, he also cast upon himself Invisibility. However just as it had with Peri the spell failed leaving him fully in view. A familiar feeling of unease causing him to look at the figures gathered around the table and Weaver Hovsus aka Maggot knew at once the two unknowns. Before he could shout a warning, a voice he knew from the past was suddenly whispering in his ear. With the parties attacks and actions over it was left for the remaining enemy in the room to conduct their actions and attacks. Just as with the party, the enemy mages went first and with the Red Robes dead, it fell to the two unknowns. The hooded cloaks a lightning fried mess they were quickly dropped to reveal the wearers beneath. A man and a woman, clad in full black and gray chain mail trimmed in red without helms. Upon the males back a longsword rested, at his sisters hip another one such was strapped. The hilts of both swords so alike as to be the same sword. As the male moved to stand beside the female, coming from around the table limping. (Orange) The party could see now that the two, so alike in the face, could possibly only be brother and sister, the female clearly concentrating her stare at Weaver. Without a look to the sister, the brother raised his hand to cast from his hand a small tear of fire to land among the party and explode into a fireball. The first of the party to die was the rescued dwarf. Hiding behind the door and having no protection and in truth no will to live he was cut to shreds by wooden shards from the exploding door. Then to finish his death the expanding ball of fire engulfed him, leaving nothing behind but ash. The ball of fire placed quite well hit Aliya next, the force sending her crashing back into the corner of the wall, burnt, dazed, but alive. The next to be hit was Rayne as the fire swept across her she was forced by the blast to the floor to lay there trying to escape the flames as best she could. However just like Aliya, she found herself hurt, in burning pain, but yet alive. For the rest the party the effect was the same without the concussive force as only Rayne and Aliya were center mass to the blast. As the flames struck all each could feel the heat of both blast and fire as their skins and normal clothing burned. With the fireball done the Orc guards moved forward to the attack. 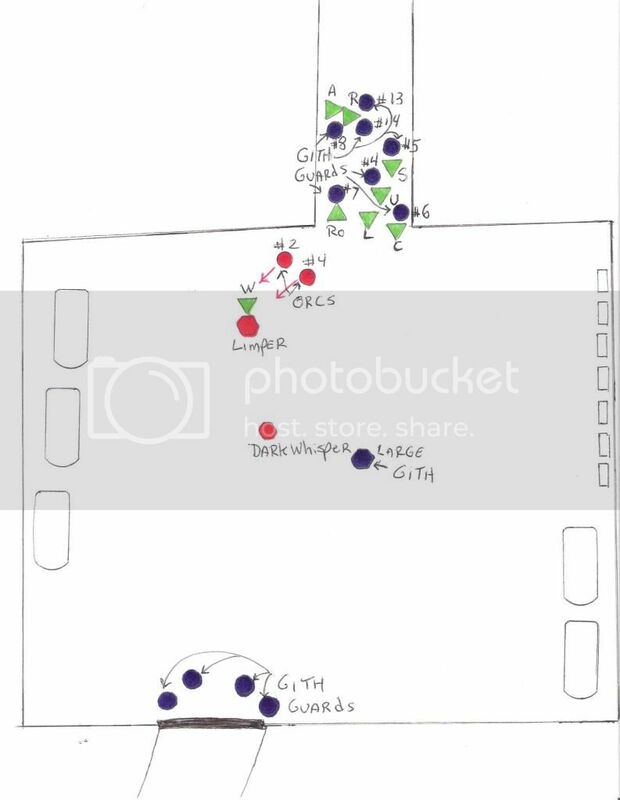 The Orcs, as if commanded, moved around the Ranger/Bard leaving Weaver alone and by himself behind them. However here the party found a small bit of advantage forming a strong defensive line against the Orcs as they spread across the doorway. With the Gith stunned for the moment and unable to phase shift the party faced only one set of foes. For the rest of the survivors at the main table, now a shattered wreak thanks to Sirene�s lighting bolt, the two Githyanki seemed to be in conversation. The human, in bright white full plate armor trimmed in black, a helmet covering the face, attached a small buckler to his right arm, drew a curved broadsword with his left and began moving forward. A black gem in the shape of a star burning a red glow upon his chest. With every member of the party wounded in some way by fire or blade and a horde of enemies before them of the known and unknown perhaps it would be better to retreat and fight another day. Posted on 2014-05-11 at 05:53:52. You want to kill one another? Then kill one another. The blistering heat of the blast still hung in the air and her own skin still radiated heat. A violent rage screamed inside her calling for blood and retribution. Already she began drawing forth power to send a returning blast of her own. Yet, as the magical power began to course through her body, Sir�ne laid eyes upon the horde of orcs that rushed towards them and the gith that would surely follow. Her own thirst for vengeance would have to wait. Burying her rage, the enchantress twisted the magic in a new direction. From the unseen world Sir�ne called forth maddening whispers to poison the minds of their enemies. With narrowed eyes she released her curse onto the orcs and gith, letting it sink into them and fester. She dearly hoped they killed one another. Posted on 2014-05-17 at 21:51:53. The explosion of flame�s searing heat rolled over the Halfling knocking him back into hall to stagger to a halt next to the enchantress Sirene. His protective clothing had helped divert some of the damage but being burnt seemed to be a common thing to him now. But it was the pain in his mind as he read Peri�s thoughts, she�d been burned too. Faerie Dragon scales weren�t as resistant to fire as a true dragons. �Peri..to me� in the pack .. take a potion of extra healing� he pictured the bottle in his mind so she would know it too. He could feel the little dragon pulling the bottle from his pack,..�Drink it all.� Then he readied himself to return the attack. A wall of eight Orcs had rushed them as the fire faded. Now they created a barrier into the room leaving Weaver cut off from them. The three fighter, Cor, Roan and Lothor, seemed to match up against two Orcs each leaving the two Orcs (3 and 7) slightly behind. From his place behind the fighters Ulthok could see these two attackers clearly. Bringing forth his bow of speed Ulthok once again used his well honed skills to place two arrows in each of those Orcs. He had little doubt that there would be more arrows flying past him from the Elven ranger, after all these are Raynes swore enemies. Posted on 2014-05-18 at 02:07:51. A man�s Will is his own. Weaver stepped through the doorway. A few words were spoken and he simply shimmered for a moment and then was once more in full view. He smiled as his hands fell upon his sword and dagger. A few more steps were taken toward his pray when the hair on the back of his neck stood on end. He knew this feeling and was a little surprised he found her before she found him. His head snapped round toward the table. It was not she for whom he thought. He shouted out a warning� �Hello Weaver Hovsus, protect me, fight for me once more against my enemies.� It was not the warning Weaver had wanted spoken, but he did know that soft voice. In all his years he only knew of one voice more beautiful than that he had just heard. All around him fell dark. When light once more came to him he saw her then before him. They stood in a meadow of wild flowers. He smiled at her, �Only my friends call me Weaver and you little one are not.� Weaver was not as he was in the room. Age had fallen upon him once more. His hands were empty, there was a sword upon his back, hair was wild and unkept, and for a moment the uneasy feeling of loose was gone. A chair, more like a throne appeared and Dark Whisper proceeds to sit. A good bit of leg and thigh showing. Weaver stepped forward, �NO! You will never be her!� The Lady DarkWhisper looked at the half-blood wide eyed. Weaver then smiled and with calm words, �Has it been so long that you have forgotten how bull headed I can be.� She slapped at Weaver but he was able to jump back just out of reach. As if the world suddenly grew larger some how the two were now drawn away from one another. She grew dark and evil and Weaver once more crouched as an animal about to strike the two screamed in rage at one another as darkness once more took them away. Posted on 2014-05-18 at 09:19:36. The fire ball barely registered as Alyia was knocked back by the force of the blast and shattered remains of the door. an watched in horror as the rescued dwarf cowering before her was immolated to ash. Alyia's head swam as the air was forced from her lungs as she hit the wall moments before the heat fire washed over her burning her lesser clothes and searing her flesh. As the intensity of the heat lessened gritting her teeth against the pain Alyia slowly got back to her feet. Her hand moving to she small pouch with thoughts of healing those around her. Pausing she scoffed to herself. When had she became a cleric, the idea was laughable to her inner self. quickly going through the mental list of spells she frowned. She was to far away for most to be effective or at least not catch any of the other part members in their wakes an thus damage them more. Alyia pulled the potion of extra healing from her belt and took a draw. (one dose 8 pts). Alyia hissed as the potion's cool burning deadened the pain, allowing her to move more freely. Putting the bottle stopper back and slipping it once more into her belt Alyia Drew her sword and turned to the hall from which they had come, only for a second. just to make sure they wouldn't be caught from behind as well as walled in. Alyia moved to Rayne's side. Posted on 2014-05-18 at 21:28:19. Smirking, Cor charged forward towards the Gith, shouting, "For Odin!" as he did so. Unfortunately, the Gith teleported away before could strike. Halting where the Gith once was, Cor stood still, in the momentary pause. It was not for long though, only maybe a split second. Behind Cor, a blast of fire sent a wave of heat over him. From what he could tell, he had not been seriously hurt from it, but the heat was still highly uncomfortable. There may have been injured behind him; however, Cor could not turn around. Filling in the Gith's place, 8 orcs surged forward. Being caught off guard at the disappearance of the Gith, Cor was barely able to defend himself, taking a blow across the chest. Cor was more than happy to return the favour, burying his axe into the second. The situation was dire. The orcs effectively provided a wall for the spellcasters to safely hide behind. Furthermore, the chaos allowed to orcs to cut Weaver off from the rest of the group. Cor had complete favour in Weaver's ability, but it was near impossible to fight a dozen or so enemies on his own. Additionally, the orcs left the party bunched up, leaving them vulnerable to attack. Cor was unsure of his exact next move, but he remembered his one saving grace: flame blast. Cor could effectively hit every orc in front of him, except he would be left highly vulnerable. Cor readied his axe to continue to attack number 7, unless an opening allowed him to use flame blast. Looking the orc in the face and smiling, Cor prepared to strike. Posted on 2014-05-19 at 04:04:19. A grimace wormed its way across the face of the ranger as Reason cleft deep into the Gith's side. Some might have taken it for a smile, but Roan reserved a kind of hateful affection for the fury of battle. He had scarcely withdrawn his blade before two arrows thumped into the back of the creature he was fighting. It stumbled backward, a line of Orcs rushing to replace it. Suddenly an explosion of flame was all around him. His hair and clothes burned in the searing heat of the fire, and every exposed part of body felt as though it would fry like bacon. His chainmail remained mercifully cool though, protecting him from the worst of the blast. Roan was glad to have sufficient guard against such attacks, but still found himself wishing dearly he had asked the protection of Odin on them all before the battle had started. Perhaps he would find a quiet moment amid the fury of battle and pray for victory. Now was not that time. Facing down the line of orcs, Roan found no alternative but to continue fighting. Twin khopeshes gripped tightly, he turned to his right and bared down on the disgusting creature that now stood before him. The color red swam in his eyes as the anger and fury he had buried in a previous life fought its way to the fore. Posted on 2014-05-20 at 05:18:55. The first to react this turn were the Sister and Weaver their battle for control of his will. So content in her believe she could overwhelm the Ranger/Bard, once Captain of the Valar citadel guards, the one known as DarkWhisper had over played her hand. Not realizing that though the Lady Andreia, now known as Soulcatcher, was as evil as the rest, this strong willed Half-Elf could still actually love one as such as her. Even using his love if needed to give him the strength to kill her.In that moment, DarkWhisper lost the battle for Weavers will. The Ranger/Bard was free to act next round once more. As predicted, the two Gith guards (13, 14) phased from sight to appear an instant later in the hallway facing Rayne and Aliya. Aliya having quickly drank a drought of a healing potion and gaining health was now at Rayne�s side as the Elf Ranger/Cleric moved back to her feet. Seeing the two Gith appear behind Aliya she quickly pushed the Fighter/Mage behind her, threw up her hand, a blazing ray of red-hot fire suddenly appearing in her fist. Then where there had been only two Gith suddenly there were seven as the five other Gith soldiers (4, 5, 6, 7, 8} phased and followed the first two. With #4 appearing behind Ulthok, #5 behind Sirene, #6 appeared in front of Sirene and behind Cor, #7 was left to appear behind Roan. The last of the Gith�s #8, appeared further back in the hallway clearly intending to help the first two vs. Rayne and Aliya. For Sirene having two Gith, one before her, one to her rear, to deal with was bad. However, for the Orcs� it was worse as she was still able to release the spell of Chaos in time. 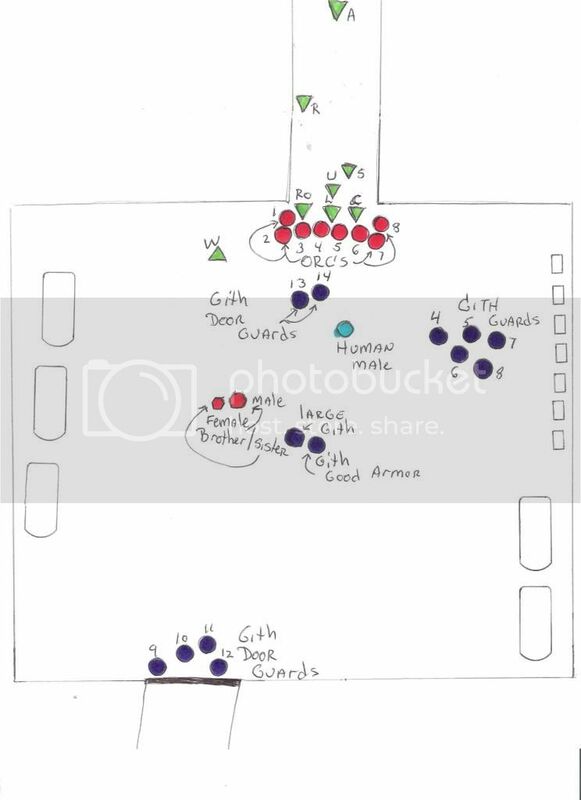 At once things on the 'front' line changed as four of the Orcs turned to walk away(1, 2, 4, 5) three turned on each other(6, 7, 8} and the last one was left facing Lothor in battle (3). For Cor seeing most of the Orc�s effected by the Elf Enchantresses spell of Chaos and knowing as the Gith phased in all around the party there would be no time later to possibly cast a spell, did so knowing he would weak in defense. A quick series of words and suddenly a 30ft column of fire was in the room and on top of the Orcs to the front and sides of the Dwarf Knight Cleric. Orcs #5, #6, #7, and #8 taking full damage from the spell and from fighting each other, died on the spot. As the spell completed its duration the four Orcs were gone, now nothing but floating ash. For Lothor finding himself facing only a single Orc #3 did not see as he easily killed it with a swing from his great sword a far greater enemy attack. The large human moving forward had found his way for the moment blocked by the wall of Orcs. Seeing no way to move around them, he had thought to stop and hold ground, however thanks to the dwarf�s spell he continued forward and through the still burning column of fire to face Lothor head on. Though Lothor tried to defend, blocking one attack, the next easily passed through his defense to strike him full on his chest. The force of the critical strike pushing him off his feet and quickly back into Ulthok. The last of the enemy to act was the brother, the one now called The Limper, a string of words from his lips and suddenly his skin became that of stone. Though limping he made his way forward, his sword so alike that of his sister, raised to strike at Weaver as the Ranger/Bard screamed in rage. Reaching Weaver, he spoke four words. (DM OOC: OK there you have my post next post this Sunday the 25th check your character sheets for damage taken. Some of you are hurting. Also as you�ll see on the map the large Githyanki Leader is still in the room though he has yet to act. He seems to be maybe waiting on something. His aide Is no where to be seen within the room. Posted on 2014-05-21 at 04:30:05. The madness of battle swirled like leaves in a tornado. Sir�ne's spell had caused so much confusion that Roan felt barely in control of himself. He lay an orc low as it turned from him and quickly turned his blades to the gith that appeared nearby. Th enemy responded in kind, but Roan was too fast for him, turning quickly to the side and avoiding the blow. Lothor was down. Roan saw him fall as he dodged the gith's sword. The man didn't have long, Roan saw. The priest in him wanted desperately to help his new ally, but to do so was to invite death upon himself. He looked across at Cor, who seemed to be in a similarly sticky situation. At least for the moment, healing would have to wait. He looked back at the gith guard, and with a shout, brought Rime and Reason flashing down in twin arcs. Posted on 2014-05-22 at 17:47:11. They were surrounded. One moment the githyanki were frozen, and the next left them wading through a sea of hostile swords. She had already tasted their metal, and her side burned wetly with the memory. Already one among them had fallen. Lothor lay in an ever growing pool of his own blood, just beyond her reach. Any could see that without magical healing the man would join his ancestors in the world beyond the living. Four among them could heal the man, and yet pressed as they were, they could do naught but fight for their own lives. it was an impossible situation, and she feared Weaver soon would share Lothor's fate. Sir�ne longed to aid the bard, but the githyanki warriors kept her from him just as they did Lothor. There was little to do but fight her way through. Scornful black eyes glared at her in a mocking challenge and she returned their gaze with an icy fury. All the githyanki saw was an unarmed, raven haired elf witch. From a distance her magic would mean death, but up close the stick in her hands would do little to deflect their steel. They could not be more wrong, she was no delicate flower to be crushed beneath their boots. Those who served the Great Goddess worked powerful magics with the ease of breath. Just as they were versed in the mysteries so too were they brought into union with the land and the ways of the wild. Sir�ne had long ago learned the wield the power of the predator, take its form, and kill. It was dangerous to take on the form of the predators of the wild, for their instinct and hunger easily took hold. One could easily loose themselves in such a form. Here and now though, that suited her well. The rage of the Goddess and the hunger of the hunter would be as one, and they would have blood. Sir�ne reached into deep into herself, beyond the serenity of the priestess or the fey presence of the elf. Deep within the darkest recesses of her being was the primal hunger of the wild. She gave herself over to it, and let the rage consume and transform her. An involuntary scream leapt from her throat and quickly transformed into a low, rumbling growl. Where once stood an elven priestess, now paced a white tiger with strange blue eyes. Fangs bared, she let loose an angry roar and leaped at the nearest githyanki. She would taste blood tonight. Posted on 2014-05-24 at 00:06:20. The pies and tarts Ulthok had provided Peri had enabled her to learn how to use both her hands and feet to hold large objects. Floating while eating was now just a natural action, so when she had pulled the potion it was simple to hold it and drink. Ulthok had told to drink it all so she had. The Faerie Dragon had felt the healing course though her , the pain of the burn had quickly left her. Then as her companion had moved to shoot arrows into the big ugly Ocrs a yellow faced creature appeared behind Ulthok and attack her friend. Just then the big human from the party had stumbled into Ulthok which saved him from the yellowface�s swords. But the big human had got hit by them instead and was knocked bleeding to the floor. Although she had fluttered away from Ulthok the yellowface had seemed paid her no mind. So now it as stood to Ulthok�s back she couldn�t just let it hit him. So hoping it couldn�t hit what it couldn�t see she cast �Blindness� on Githyanki (#4). Posted on 2014-05-25 at 02:32:33. Battles always flow but not always like water. Ulthok thought the Githyanki were stunned enough to allow them to concentrate on the charging Orcs. But just as he loosed his arrows into the big Orc pandemonium broke. The Gith phased in behind each of them. There in front of him appeared a Gith that chopped into Cor�s back knocking his old friend to the ground. Then Lothor stumbled into the Halfling knocking him to his knee. From over his shoulder the blows intended him crashed into the human Gladiator instead. The distraction would allowed Ulthok to escape the Gith back attack. The mage used the opportunity to help his friend. As the Gith stood over Cor with its back to Ulthok the mage attacked and leapt on its back casting Vampiric Touch to drain its life forces and replenish his own. Posted on 2014-05-25 at 03:23:10. Alyia was swept aside as Rayne pushed her behind herself taking the brunt of the first atack. Alyia cursing the confinements of the hall, which negated the use of her larger spells of fire or ice. wanting to simply jump into the fray, Alyia still head-shy from her last fumble. moving to stand beside Rayne, Alyia turned to face the glith. Sword in one hand, small trendrels of tri coloured dust motes hovered forth from her other hand. the motes danced in the air only seconds before blasting forth in a brilliant cone of swirling fractal of moving light. As Alyia casting colour spray. Posted on 2014-05-26 at 03:12:18. �You first, Limper my old friend.� Not knowing the state of the mind of the two Orcs to Maggot�s left he faints an attack to the left but at the last moment shift his weight slightly and attacks to the right. Using all four of his swings on Limper. Posted on 2014-05-26 at 22:29:04.